This will be the first of two lessons looking at the third category of DSS, the expert system. Today will be a brief overview, while tomorrow we'll knuckle down and look at the nuts and bolts that make an expert system work. Contrast between experts and expert systems. Outline some of the difficulties in designing and implementing an AI-based DSS. 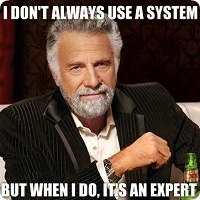 Account for why expert systems would be designed to be domain-specific.